A DESCRIPTION: The Cha Cha is an exciting, syncopated, Latin dance, which originated in the 1950s as a slowed down Mambo, the Cha Cha gathers its personality, character, rhythm, basis, and charm from two major dance sources. It is a derivation of the Mambo through its Latin music, and it is also a stepchild of the Swing, as it is danced to a 1-2-3 step rhythm. The Cha Cha gets its name and character from its distinct repetitive foot rhythm. Cha Cha is one of 8 country western dances sanctioned by the UCWDC (United Country Western Dance Council) who describes Cha Cha as a "stationary dance with intersecting patterns performed with Cuban motion, emphasizing the first beat of each measure"
GET A FREE CHA CHA DANCE LESSON! We'd love to share our passion for cha cha dancing with you. Your first private cha cha dance lesson is FREE! Singles or couples welcome (no partner necessary). 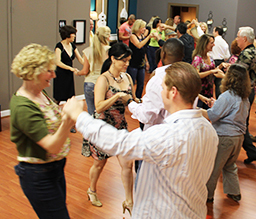 A free private cha cha dance lesson is the best way to meet the teachers, see the dance studio and get an idea of what learning cha cha dancing in Houston is like. © Anthony Lewis Dance offers Cha Cha Dance Lessons Houston TX. If you are interested in cha cha dancing in Houston, call (713) 259-4162 now for free cha cha dance lessons Houston TX.